India is an agricultural country, 70% people depend on agriculture, because the only major means of farmer’s income is agriculture. Intensive agriculture practiced without observance to the scientific principles and ecological aspects has led to loss of soil health, and reduction of freshwater resources and agrobiodiversity. With progressive diversion of arable land for non-agricultural purposes, the challenge of feeding the growing population without, at the same time, annexing more forestland and depleting the rest of life is indeed daunting. Additional, even with food availability through production, millions of marginal farming and landless rural families have very low or no access to food due to lack of income-generating livelihoods. Approximately 200 million rural women, children and men in India fall in this category. Under these circumstances, the evergreen revolution such as pro-nature, pro-poor, pro-women and pro-employment/livelihood oriented ecoagriculture under varied terms are proposed for achieving productivity in perpetuity. Indian farmers are becoming poor due to the daily deterioration in agriculture, the main reasons for this, not receiving quality based seeds, delay water irrigation, reduced soil fertility and excessive use of chemical fertilizers. In order to remove these problems, we have been to develop a new strategy which will double the income of the farmers and make the soil fertile without the use of chemical fertilizers. Our government is constantly trying for it, which help farmers to get maximum benefit and improve our agriculture from launch new schemes for water, seed, nutrients and insurance the crops are started and organizing time to time a mega fair for providing basic knowledge for the farmers. So that more and more farmers are aware of it and use good machinery, seeds, and biofertilizers in their agriculture, so that their income accompanied, soil fertility can also be increased. Agricultural research are constantly probing fertile seeds, improve nutrition and organic fertilizers which will help us to grow agriculture. Fifty decades before came green revolution, which improved crops yield and productivity, while today need to be evergreen revolution for agricultural improvement, for doubling farmers income, enhance crop productivity and also improve soil fertility. 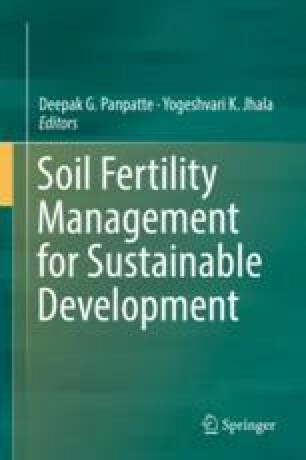 The principles, strategies, models for sustainable agriculture and pathways for doubling farmers income are described in this book chapter. The authors are grateful to the Department of Microbiology, Akal College of Basic Science, Eternal University, Himachal Pradesh and Department of Biotechnology (DBT), Ministry of Science and Technology for providing the facilities and financial support.